i would like to calculate age via birth date picker. I saw some previous issues in Forum, but the problem is that we would like the user to choose the birth date from drop-down list (as it is in birth date picker) and not from calendar (as it appears through date picker). Is this possible? Waiting for your answer. 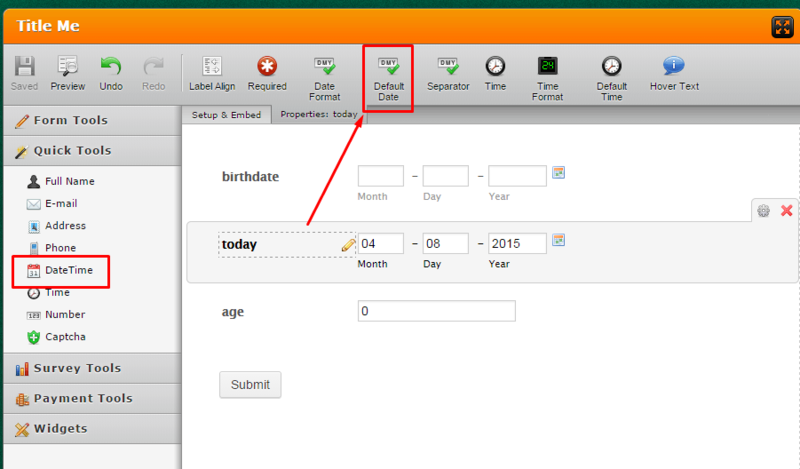 I believe it is not possible, because in order to determine the age we need an extra date field that gets the today default date, so we can subtract from the birthdate. And the only date field that has the default date option is the DateTime field which uses numeric values for months, as the BirthDate Picker uses text values for months. I forwarded a feature request to our developer's team so they can take into consideration a future implementation. They will contact you via this thread once they have an update on this. Can I please be contacted when this feature becomes available. I so much would benefit from this feature. 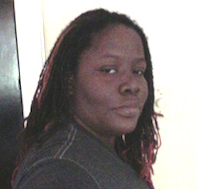 i am just starting to use the calculation in a form i am testing. However, I am finding that in my browsers, the calculation is not happening unless I "refresh" my screen. In the Jotform site, when I test it, it calculates real-time, but not when I have it embedded in my HTML code. I need it real-time because I have a couple other fields that are dependent on the age calculation. 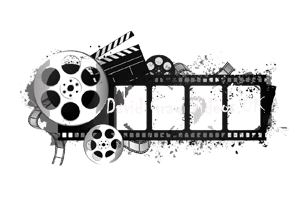 It sounds as there might be some conflict between our form's scripts and the scripts on your page. 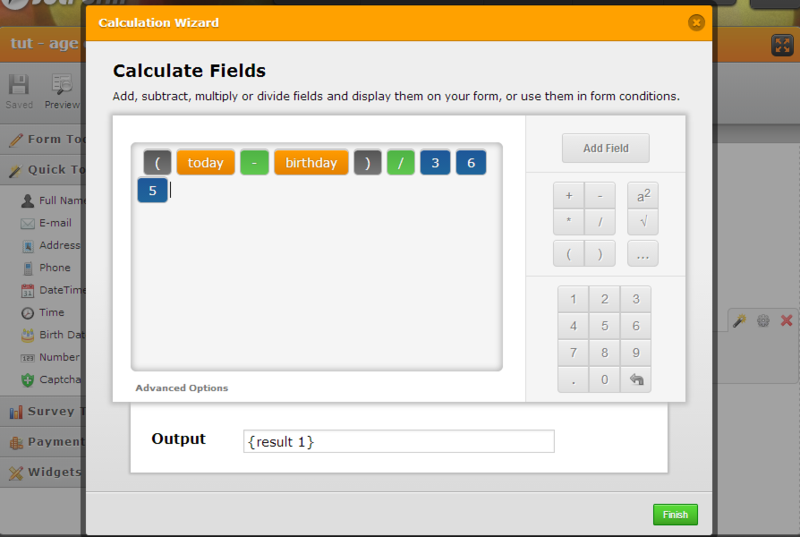 Can you please try embedding the form as an iFrame embed, and see if that resolves the issue in automatic calculation? It would also help if you could provide us with the link to the page where you have embedded the form, so that we may take a look into what is going wrong with the calculation. Please let us know, we will be glad to assist you. As far as I can tell it is accurate. It is based on the template mentioned above, but uses the Birth Picker and is accurate (at least within one day). 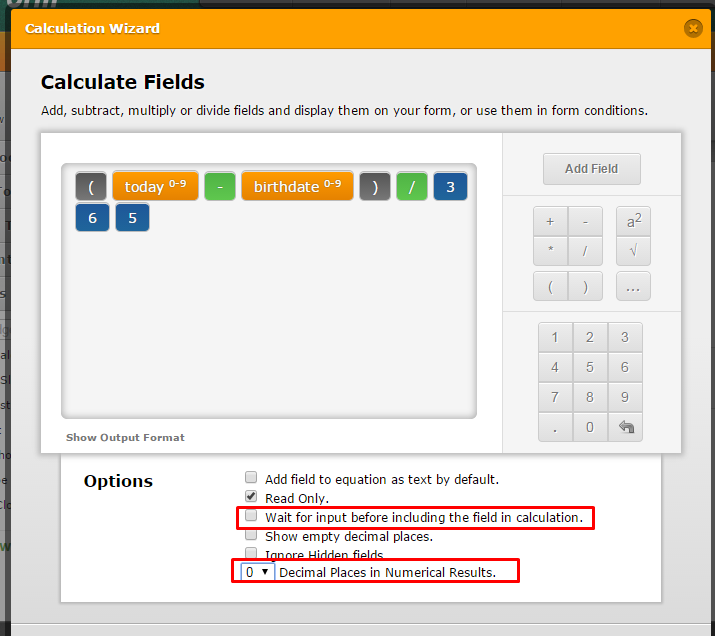 Thank you for your valuable input in finding a solution to getting calculations done with the birth picker.